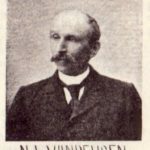 Follow this link below to the diaries of Newman L. Van Deusen (1847-1930) that span 67 years of his life! Van Deusen lived in nearby Hinckley, Ohio, and wrote in his diary every day from 1863 to 1929. These notes were transcribed from over 24,000 pages in the original journals, now housed at the Hinckley Historical Society. His writings are valuable in understanding the incredible changes that took place during his lifetime, right in our own local area.